The SOC contents in most agricultural soils are below their potential levels, especially soils in developing agricultural systems (Lal, 1999). Carbon content of Zambian soils is low, ranging between 0.5% to 1% organic C (Singh et al., 1990), with an average of 0.8% (Silanpaa, 1982). In the three agro-ecological regions of Zambia, benchmark data of organic C content (Table 25.1) range from a low of 0.15% to 1.11% for bottom soils (38- to 70-cm depth) to a high of 2.45% to 3.0% for topsoils (0- to 8-cm depth) of clay soil (Lungu and Chinene, 1999). Other soil texture types show similar variations. When cultivated, these soils rapidly lose considerable amounts of organic C. The historic SOC loss can be regained by converting to an appropriate land use and adopting recommended agricultural practices (Lal, 1999). These include conservation tillage, mulch farming, cover crops, INM consisting of widespread use of biofertilizers for soil fertility replenishment, crop rotation, use of multipurpose agroforestry and green manures, soil water conservation, water table management, efficient use of irrigation water, erosion management using vegetative barriers, and other cultural practices in areas with high erosion hazards (Figure 25.3). Source: From Lungu, O.I.M., and V.R.N. Chinene. 1999. 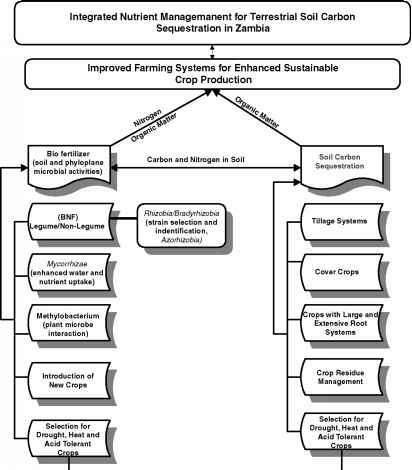 Carbon sequestration in agricultural soils of Zambia. In Zambia Status Paper, presented at Workshop on Carbon Sequestration in Soils and Carbon Credits: Review and Development of Options for Semi-Arid and Sub-Humid Africa, Earth Resources Observation Systems Data Center, Sioux Falls, SD. Available at: www.kafuku.org/wwwboard/mes-sages/5.html. With permission. potential for SIC sequestration in soils of arid and semi-arid regions from formation of secondary carbonates (5 to 50 kg ha-1 year-1) and leaching of carbonates into groundwater (50 to 500 kg ha-1 year-1) in irrigated soils (Lal, 1999, 2001).